Google analytics is one the mostly used tool by webmasters for analyzing and calculating traffic statics of their websites .The main reason for the popularity of Google analytics is that its free and highly accurate in calculations. Till now we were accessing Google analytics via its website . Now here we have an application that is built with Adobe AIR ,which can be used to collect and display Google analytics informations on Windows , MAC and Linux desktop . 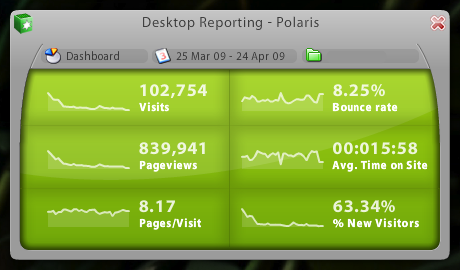 Download Polaris , Google analytics desktop client . Its very important to a have analytics code on every website . We can gather informations about our site regarding the source of traffic , most visited pages etc. and make a target plan according to that . If you are not using Google analytics sign up here . It uses Adobe AIR ,the technology for running web applications on desktop computer .. Your Google analytics data will be shown as in screenshot . Polaris is free for one site and there will be small price for comparing and adding more sites . 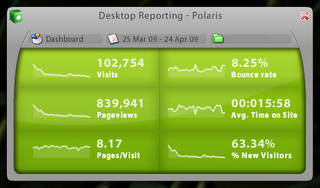 Almost all features in Google analytics and available on Polaris desktop client . It is cross platform and can be used in Linux ,MAC and Windows . 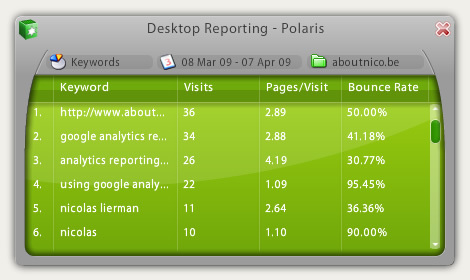 Download Polaris and access Google Analytics from desktop . Requirement : Need to have Adobe AIR installed .